Do you work with fathers who struggle with money? Sadly, some dads see their role strictly as check-writer-in-chief while other dads struggle to make ends meet. It doesn't have to be this way. Whether it's child support, legal fees, or having to work two and three jobs to pay for life, many dads struggle with money. Most dads need to learn how vital money management is to their role of being good dads. We created this new tool to teach dads why they should manage their money and give them an easy action plan to help handle money. When I talk to facilitators, one of the biggest issues their dads face is money. Think about it. Where did you learn what you know about handling money? Who taught you? A good dad understands his role and knows the importance of setting aside money for his and his family's needs rather than just the wants. This resource will help dads better manage money and can be used to help fathers in any setting. We've had facilitators tell us the dads they work with struggle with wanting the latest phone, shoes, or car instead of buying diapers or school supplies for their children. While many dads struggle financially for many reasons, the point here is this: As a fatherhood facilitator, you can feel prepared to help dads better manage money. You just need the right tool. Learning to manage money is a vital skill. Sure, some dads are out of work and a job is the answer. But, for many dads, money may not be the real issue...managing their money is the issue. Managing money is challenging and can seem daunting without the proper skills and planning. You, the mentor and leader, can help start a dad on the right track by giving him the steps he needs to start succeeding. action steps to take with your money that will help dads better manage their own - and their family’s - money. 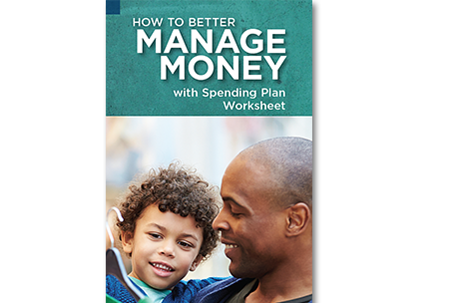 This helpful brochure comes with a bonus—it includes a spending plan worksheet for even better success! Sold in Packs of 50, this resource will help you help the dads you serve. Use it as an easy way to start a conversation about money management or pass it to a dad so he can start heading in the right direction. Find How to Better Manage Money in our store today. Are you a dad looking for help or interested in volunteering for a local fatherhood program? Please visit our Fatherhood Program Locator™ to find programs and resources in your community.